You’re finishing nursing school and gearing up to take the your NCLEX to become a registered nurse. You’re scared to fail and just want to do whatever you need to do. You’ve heard of some NCLEX reviews, with varying success, and don’t have a ton of money to spend to try them all. Every year there seems to be another option and it’s quite confusing. So, what are the best NCLEX reviews for 2018? I’m a registered nurse. I’ve personally taken the NCLEX and passed in 75 questions in one attempt. I’ve written NCLEX review questions. I’ve thoroughly researched the latest and best NCLEX review programs, personally trying four of them through my research. I will tell you what I’ve heard through the grapevine from past users, my personal experience, value for your dollar, and more. Please note that I discuss prices in these explanations, however they are the prices as of March 2018 and may not reflect the most current price structure. We’ve outlined some of the best NCLEX reviews in this comparison table to make it easier to find the one that is right for you. You can click NCLEX review name on any of the items in the table to jump to the section in this article outlining more information about it. Or, you can click the “Buy Now” button to pick it up immediately. There used to just be one or two NCLEX review options out there. But there have been a ton of advancements in NCLEX reviews since I sat for boards in 2010. The good news: it’s not longer a one-size fits all approach. You can find a program that fits your unique learning needs without spending $500. To wade through the various options of NCLEX reviews, you must first decide what would be best for you. Not your BFF nursing buds, not your spouse, not your parents – you. Do you want a content review and strategy to answer NCLEX questions? Do you need to know how the NCLEX works? Do simply want some practice questions? Do you want a concise content review to refer to as you answer questions? Are you someone who needs an in-person review or are you someone who wants everything online? Will you use flashcards on your phone? Do you want an app so you can answer NCLEX questions on your phone or tablet? Don’t just do what everyone else says you have to do. Think about what you would find most valuable and helpful for your unique learning needs. There should be no shame in your self-awareness game. Kaplan, Hurst, and ATI are the major companies providing NCLEX reviews who provide very similar products and cost structures. I actually took the Kaplan in-person review course in 2010 after graduating. Each course provides are large bank of NCLEX-style questions with rationales (a minimum expectation in a review program), practice exams, and customer support. The each have their own money-back guarantee if you don’t pass, with varying restrictions. Kaplan was NCLEX review program I selected after graduating. Back in 2010, there were not as many options and this is what everyone I knew who was also graduating chose. I completed the week-long in-person review, used their study plan, strategies, and Q-bank, took and passed the NCLEX one month after my nursing school graduation in 75 questions in about 80 minutes. My experience was good, but since 2010 there have been quite a few more cost-effective options developed with much more to offer, in my opinion. I’ve heard similar things about each program through the social media grapevine when I asked licensed nurses about their opinions. Check out this post on my Instagram, and this post on my Facebook Page to read them yourself. Many loved these programs, while others said they were awful and went and bought something else. To compare this to prom dress shopping… Kaplan, ATI, and Hurst are those $400 gowns that get the job done, are a safe option, and offer a classic look. You bought it online so you couldn’t try it on before committing and spent a ton, but were relatively confident it would fit. You’ll drop another $100 on shoes and jewelry, and it’s a bit of a production. You’ll never wear the dress again after that one night. Let’s say you don’t want or need all the bells and whistles. Maybe you’re just looking for a solid NCLEX question bank with good rationales. Maybe you would rather pay a subscription for access to questions for a chunk of time, rather than one (extremely) large payment. UWorld is a great option here. It’s a question bank that is designed to look similar to the NCLEX. They provide rationales, flashcards, can track your performance, and the price point is much lower (around $100 – $250). I’ve also personally tried it and was really impressed. You’re not going to get any content review outside or the rationales in the questions, or a standardized process to answer them (like Kaplan’s decision tree), but you will get an outstanding large databank of questions. I was personally impressed with the functionality of the site, price options, quality of questions, mobile-capabilities, and tracking. This is a test-prep company, so they’ve got the interface down. Another option for the minimalist is the NRSNG Nursing Practice Questions Pro. It’s a question bank broken down into the different NCLEX categories so you can focus on areas you need the most practice in, provides quality rationales, and performance tracking. You actually can see your Global Rank (meaning, how you stack up against others answering the same questions). You can get a 5-day trial for just $1, then it’s only $14.99/month after that. I’ve personally tried it and think it’s right up there with UWorld. Bonus: this company is run by a nurse! Both of these offer free test questions to give them a try as well. UWorld and NRSNG Nursing Practice Questions Pro is like the prom dress that’s a fraction of the cost but looks awesome. There’s no buyer’s remorse because you didn’t spend your last paycheck on it, were able try it on a lot before committing, you’ve already go jewelry and shoes that will look awesome with it. But, you’ll never wear this dress again. One of the newer NCLEX review programs on the market is from the NCSBN. Have you heard of these people? They’re the people who actually wrote the NCLEX. This is a test-prep program from the people who write the test. I tend to pay special attention the NCSBN in regards to the NCLEX because they are the ultimate authority. The NCSBN NCLEX Review is the program I know the least about. However, multiple people mentioned it positively in those previously mentioned social media posts asking for input. I also love that on the website, they list out all of nurses who contribute to it with their credentials (MSN, DNP, PhD prepared nurses, people!). I tend to take note when a nursing website is upfront about who they get their content from and if they’re owned by nurses. Many are owned by large companies who contract nurses for the nurse-related content… something I’m not a huge fan of because I know their bottom line is money, not what’s best for our profession and (by extension) our patients. It’s subscription-based with a tiered cost-structure, so you’re looking at spending $50 for the 3-week plan, all the way up to $150 for the 15-week plan. I’ve heard the content is pretty stellar, as are the questions (rationales included). I cannot speak to its online functionality, but do note that it is mobile-friendly. They highlight their Ask the Instructor feature to gain additional insight when you don’t understand the question and need further clarification. One huge negative I’ve noticed is if you want to extend your subscription, you’ll lose all of your progress. For example, let’s say you bought a 3-week subscription but towards the end decide you want to extend it because you’re not quite ready. While you can purchase another subscription, you’ll lose all of the progress you’ve made within those 3 weeks are start at square 1 with your new one. You also will lose all access to the content once your subscription is over. Pros of the NCSBN NCLEX Review: it comes from the ultimate NCLEX authority, is cost-effective, has the Ask the Instructor feature, contains a comprehensive content review, mobile-friendly, and is run by nurses. Cons of the NCSBN NCLEX Review: the website is archaic, (it looks like it hasn’t had an update since 2002) therefore I cannot speak to the interworkings of its functionality, it does not look like there is a money-back guarantee, you’ll lose access to the content once your subscription is done, from looking at the website it doesn’t seem like customer service is too awesome, and you must make sure to pick the right subscription length the first time because you’ll lose all of your progress if you need to extend. The NCSBN NCLEX Review is like that prom dress you found online that was made by PROM ITSELF, was on clearance, but still makes you look great. You weren’t sure if you’d like it and couldn’t try it on, but decided to take a little risk anyway. You’ll never be able to wear the dress again, but it served its purpose. Now that I’ve been a nurse for eight years, I look back to the NCLEX prep-period and realize how short-sighted it was. I was so focused on one exam, but my learning had really just begun. Years later, looking back at nursing school resources and NCLEX-prep, I am now prioritize something that offers more. Which programs continue to benefit you after the NCLEX when you need to brush up on clinical skills or knowledge? Will the Kaplan Q-bank help you out there? Or the UWorld rationales? Likely not. The NCSBN one has potential, but you’ll lose access to it once your subscription is complete. 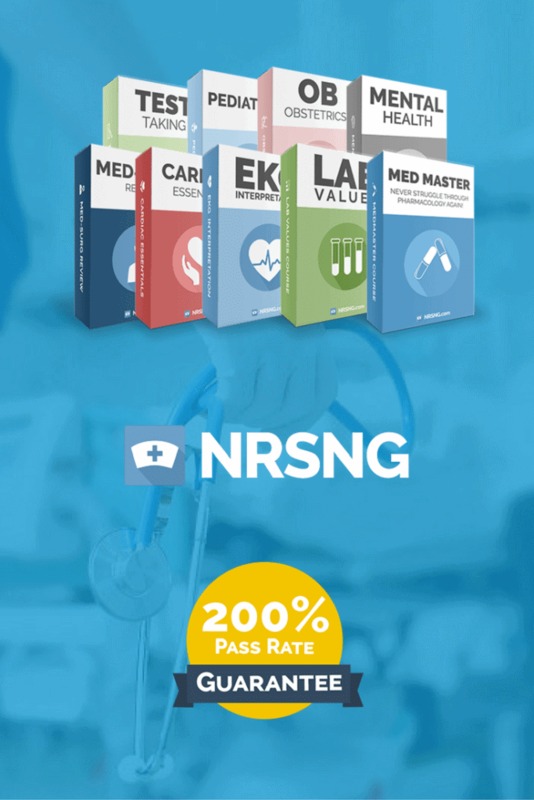 The only NCLEX review program that I’ve seen that will adequately prepare you for the NCLEX and continue to be valuable well beyond that as you prepare for your first job as a registered nurse is the NRSNG Academy. It contains 10 condescend courses (Test Taking, Fundamentals, Med-Surg, EKG Interpretation, Cardiac, Mental Health, Pediatrics, OB, Pharmacology, Lab Values) as well an NCLEX prep program. You can even get a 7 day trial of academy for only $1! I’ve personally used the pharmacology course, EKG, and cardiac courses to help deepen my understanding of cardiac-specific issues because I work on a cardiac med-surg floor and it has been invaluable. I’ve used the drip charts when I was in neurocritical care, and the pharmacology course again. There were so many ah-ha moments going through each module that deepened my understanding of nursing knowledge. Essentially the NRSNG Academy is access to their entire content library plus their NRSNG Nursing Practice Questions Pro (previously outlined), simulation NCLEX exams (SIMCLEX), and a flashcard app. So, if a question doesn’t make sense you can go to the corresponding content and learn more about it. Their content library contains modules of images, audio files, quizzes, cheat sheets, video lectures, flashcard app, case studies, text outlines, and transcripts. Try out Acadmey for 7 days for only $1. Then NRSNG Academy is a monthly subscription of $49. After 9 months, you’ll have permanent access to the content and subsequent updates. It is definitely one of the most cost-effective options. Once you join, you get access to their private Facebook group for additional support and encouragement, which is run by the founder and nurse, Jon Haws BSN RN CCRN. If you use the NRSNG Academy and don’t pass the NCLEX, they provide a $200 money-back guarantee. NRSNG Academy is like that prom dress that was a fraction of the cost of the other ones that you took home and tried on for a few days before committing. It ended up looking outstanding and was really comfortable. You were able to wear it over and over again well after prom and continued to look fabulous. I would be remiss if I didn’t mention two people I’ve heard amazing things about for one-on-one NCLEX prep. Some people have high test-anxiety or very specific needs that won’t be adequately addressed in a group in-person setting like Kaplan or Hurst. Some may need some individualized support after failed attempts at the NCLEX. There are a few options available for these unique situations! Damion Jenkins, MSN RN over at The Nurse Speak offers in-person or online individualized mentoring, coaching and instruction for the NCLEX. He offers a free phone consultation for people to see if it would be a good fit for them as well. I’ve personally met Damion and interacted with nurses who rave about the support he provided them. Chelly Bevel, PhD(c) RN over at Chelly’s Nursing Review is another in-person option that I recently learned about. I could not believe the overwhelmingly positive response from those previously mentioned social media posts asking for NCLEX review recommendations. Clearly, both run by NURSES! Long are the days when Kaplan, ATI, and Hurst were your one-size fits all NCLEX review options. If you’re okay spending about quite a bit on something you’ll never use again but can rest assured it works for most people, go with Kaplan, ATI, or Hurst. If you want a cheap online bank of questions and content review from the people who write the NCLEX and nothing more, go with NCSBN – but make sure you pick the right subscription! If you just need some NCLEX review questions to brush up on and get your mind into NCLEX-mode, go with UWorld or NRSNG Nursing Practice Questions Pro. And if you’re in one of those unique situations requiring some individualized attention, check out Damion or Chelly! I am in the midst of taking the ATI course as it is required for me to re-activate my license(life as mom took over career). All of us, including the instructor are very underwhelmed at the quality of their program. We find mistakes everywhere. Conflicting information in the books, wrong answers to questions(EVen the rationale proves their choice wrong), typos, grammatical errors, answers that don’t match the question at all. They can focus in on minutia of such unimportance on the questions, that it makes it very difficult to determine what to focus our study time on. I graduated years ago but we had to use ATI. I felt like I had to learn their style of questions, which I felt like were different than NCLEX. I wasn’t a fan of making us take that and including it into our tuition and essentially not giving us an NCLEX review choice. Back then I only found a few mistakes here and there, but I can’t say I’m terrible surprised to hear you’re finding mistakes as well!